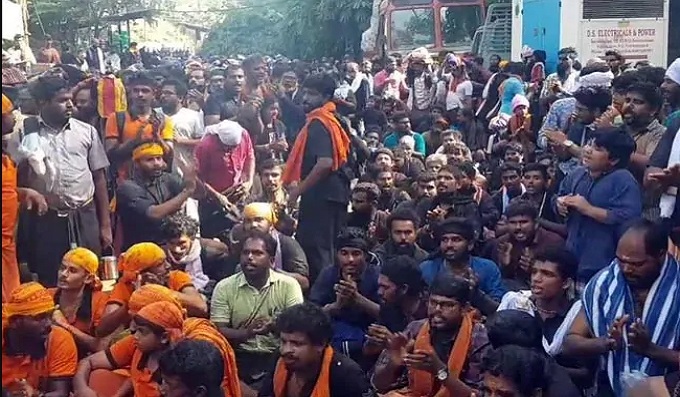 THIRUVANANTHAPURAM: Massive protests broke out near the Sabarimala temple this morning after two women tried to trek up to the hill shrine. The women were surrounded by a large number of protesters around 1 km after they crossed the base camp. The women were taken to safety by the police in a vehicle. They had earlier refused to return without offering prayers, saying they followed the 41-day penance. The two women are part of a nine-member group who were on their way to the temple. The group was stopped after they crossed the Pamba base camp. One of the women, who is from north Kerala, claimed she has been getting death threats ever since she began her penance. "If they"re trying to scare me away, I am definitely not ready to go back," she told reporters. "There is Ayyappan there. Ayyappan has no objection to women entering the temple. Why are these people protesting then?" she said. Activist Rahul Easwaran tweeted, backing the protesters who stopped the women who tried to "intrude into #Sabarimala". Huge protests erupt for #SaveSabarimala..
On Monday, Kanaka Durga, one of the first women below 50 to enter the temple, was attacked at home allegedly by her mother-in-law. She had entered her home after nearly two weeks in hiding because of threats by right-wing protesters. She alleged that her mother-in-law came at her with a wooden stick and beat her until she could barely stand. Then she was thrown out. Kanaka Durga, along with 40-year-old Bindu Ammini, are the first women below 50 in decades to enter the hilltop shrine. For nearly two weeks, they stayed in an undisclosed location on the outskirts of Kochi, under state protection. The temple has been the site of tension since the Supreme Court ruled on September 28 to end the age restriction on women. The court order has not been accepted by the devotees and protesters who believe women should not be allowed near the shrine"s deity, Lord Ayyappa. Since the court order, attempts by women to visit the shrine were blocked by thousands of protesters.